Two years of my ramblings, which apparently people like to read. I can now totally get all emotional and gushy about this, because blogging has totally changed everything for me and I literally can’t imagine what my life would be like if I wasn’t doing this! I wouldn’t have discovered my passion for food photography, and I’m waaaay more creatively aware than I was 2 years ago. But then there’s also all of your comments, tweets, likes and everything else. You’re all so supportive, kind and funny. So THANK YOU! It makes me want to dance like this, and send cupcakes in the mail to everyone. There are many more stories and facts for me to share, I’m sure. For today, I’m going to tell you about how I don’t like making layer cakes (which you may have noticed by the lack of layer cakes on this blog). Really, even after 730 days, and over 100 recipes, I think I’ve only posted one recipe for a layer cake. It’s not like I don’t like cake, I love cake. Cake and me? Bahst frahnds. c) layer cakes are also very big, and there’s only 3 people in this household soooo that’s a lot of cake to consume. Also baking multiple cake layers for a nice tall cake, when you only have two cake pans is pretty much the most annoying thing evar. I ain’t cleaning that cake pan up just to use it straight away, again. Ugh. Okay so I’ve found many faults with layer cakes. However, this layer ‘cake’ seems to overcome quite a lot of those hurdles. They’re smaller so you can make MINI layer cakes. It’s a celebration basically for myself today and I don’t care if the cake has been cut. See, the pancakes solve a lot of problems here. 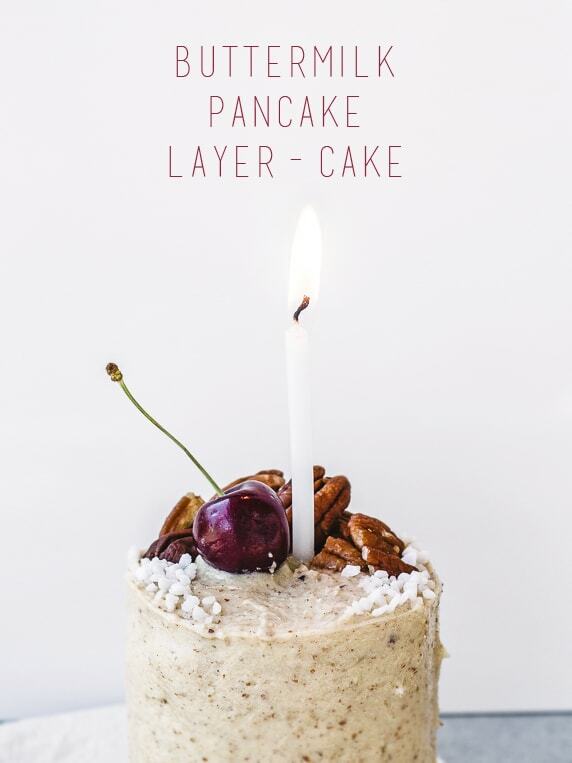 I knew I didn’t want to make a layer cake for this blog birthday (because of the reasons above), and I’d been thinking about a pancake cake for quiiite a long time before hand (because I don’t understand how you can look at a stack of pancakes and not see it as a mini cake, c’mon). 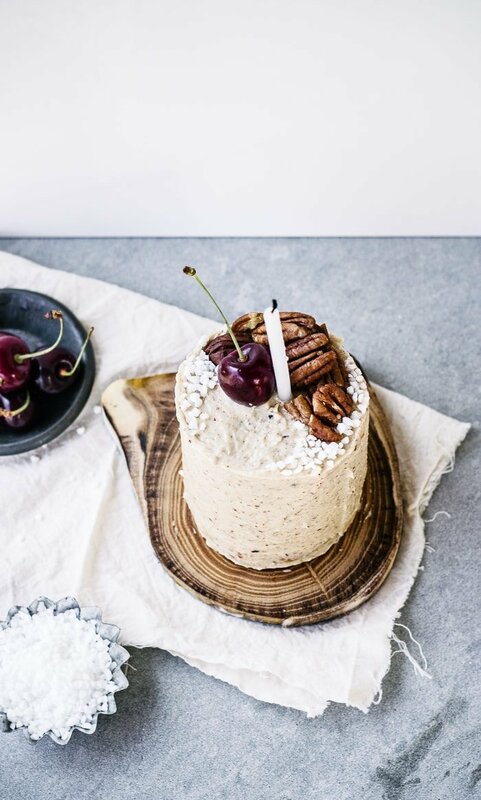 And then with Beth’s waffle cake last week (which I just looked at again, and now I realise it has cherries on top too.. so apparently I’m doing some subconscious decoration copying , okayyy…. :/ ) , it pushed me over the edge and I knew I would be making a pancake cake for today. Now, you can’t expect this to be like a normal cake. It’s just a stack of pancakes with frosting disguising it as a cake. If you put the frosting on the pancakes whilst they’re still warm, it melts into a reaalllyyy good buttery sweet syrup to eat with them as you would maple syrup. Or you can do as I did and let the pancakes cool and then frost them in a stack. I make my own pecan butter by toasting pecans lightly in a skillet until just fragrant. Then I blend them in a food processor with 1 tbsp of oil for a a few minutes, scraping down the sides of the blender bowl every now and then, until smooth + liquidy. It’s also AMAZING on toast w/ some maple syrup, or on yogurt with some fruit. This is omg so cute. Mini cakes are the bomb. diggity. And also I agree with ALL of your layer cake qualms which is why i have also never attempted a layer cake. THIS i can totes handle. I also have a mini cake stand which i bought based on its adorableness. thanks Caitlin! They really are, it’s basically your own cake. 8 slices of cake? all for me? HELLO. Ahhh yes those mini cake stands, they’re always one of those things that catch my eye!! AHAHA, love that .gif so much 🙂 Ikr, there are so many frosting possibilities too ahhhh my mind is meltinggg. thanks Irene!!!! I know, it’s crazy to think it’s been TWO YEARS already. This is the BEST idea ever! I am totally making this mini cake. Your blog is amazing! I’ve been an avid reader eversince! You inspire me everytime I read your posts! Although not all the time i would leave a comment. Happy Birthday and lots pancakes, i mean birthdays to come! Super glad to hear it Mischelle 🙂 Thank you! Congrats on 2 years! Beautiful cake. Can’t wait to see what you dream up in the next two years! thank you Dana 🙂 Same to you! Congratulations Izy! Love love your work and can’t wait to read TWC for many more years to come. I would totally down that pancake cake for breakfast every day omg. thank you Karen 😀 I’m so happy to hear that, Citrus and Candy has always been one of my top sources of inspiration! 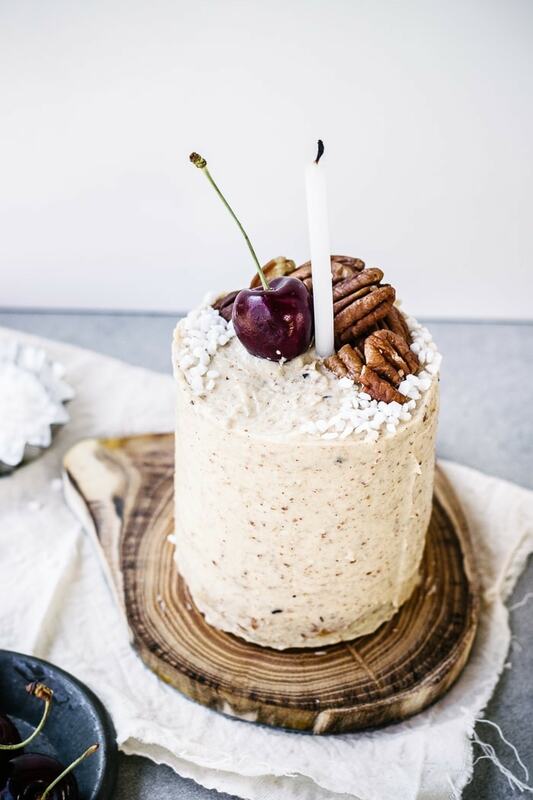 Happy Birthdayy… The cake looks amazing and that buttercream. Give me a jar of that and a spoon anyday! You’re celebration cake looks amazing! 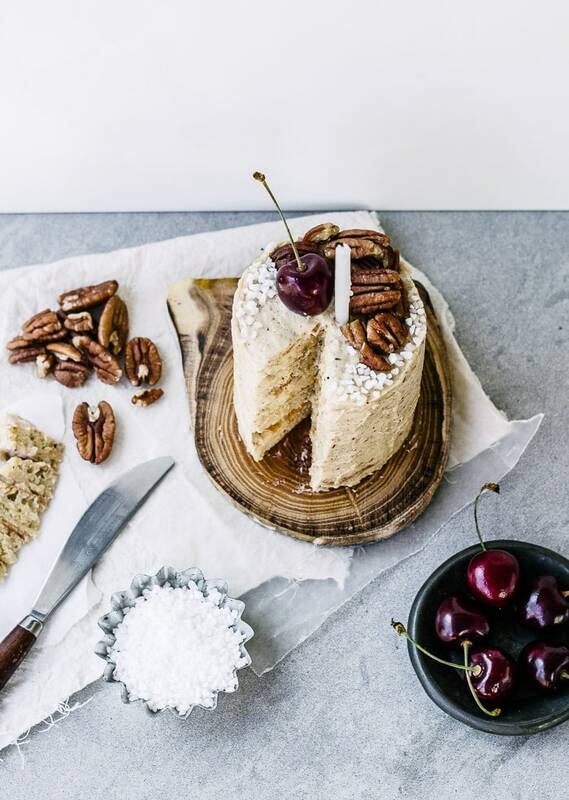 What’s better than pancakes and pecans? Nothing omg. Happy happy two years of blogging! Beautiful cake!! Looks fabulous. Super cute teh idea and the gif. Congratulations, you are a big inspiration 🙂 Happy 2 year!! Two years is so exciting!! I’ve been following you for a long time now, and I always look forward to your posts. Cheers to another two years! Oh, good lord. Pecan butter? Seriously, I’m like drooling everywhere. GAHH. I have the same relationship with layer cakes as you do… I can’t decide if I love them or hate them. The cuteness of this pancake cake is KILLING MEHHHH! I must make one. Like tomorrow. And eat it for breakfast. thanks girl! DO EHT, power to the peopleeeeee! A big congrats to you on 2 years of blogging! That is amazing! I can’t wait to see what else is in store for you! Yay! Girl, I’m so glad you made this blog…it is truly one of my faves. Congrats, Izzy!! I’m pretty sure this may be the best thing I’ve ever seen. I mean pancakes and frosting? Put a fork in me, I’m done, I’m just going to sit around and eat these if anyone needs me. Happiest Blogaversary! Two years is such a lovely accomplishment and this cake is just too amazing for words. Why shouldn’t icing and pancakes go together? Cheers to you and to many, many more years of blogging awesomeness! Congrats! I love everything about this, and I”m honored to be even the teensiest bit of inspiration! Breakfast, buttermilk, and cherries are all things that should be involved in far more cakes. Just today I was making a cobbler and eyeing the sweet biscuit dough thinking “who says I can’t put you in a cake pan…?”. All breakfast cakes. All the time. Maybe the biscuit cake needs to be vanquished next! Again congrats… you are wildly talented, I’m always so impressed. Congratulations! Love the recipe. Would you mind telling me where you got that ringed wood serving plate? Yay, happy bloggerversary! Your posts are always so fresh and creative (not to mention funny!). 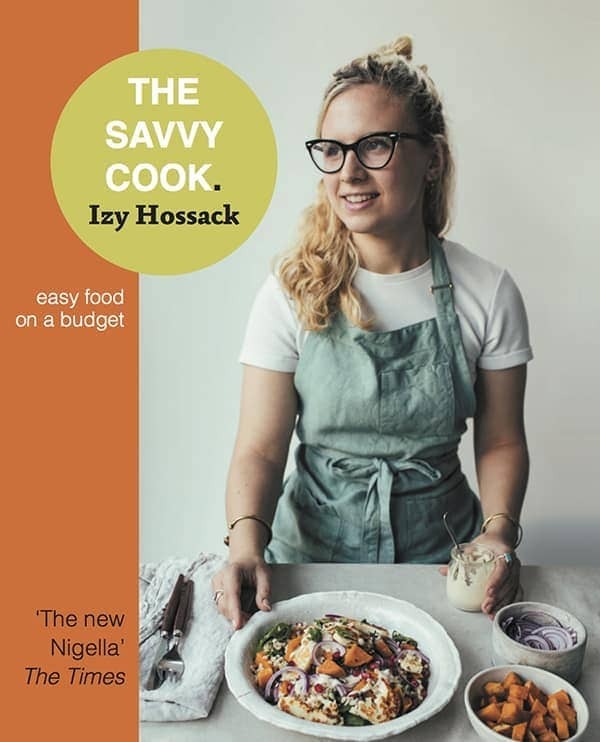 Here’s to lots more classic-Izy posts to come! So cute. I love tiny foods. I used to make pancake cakes with regular swedish thin pancakes, jam and whipped cream when I was a kid – but never tried with small american style pancakes!! Sounds like a win! And congratulations on the anniversary! 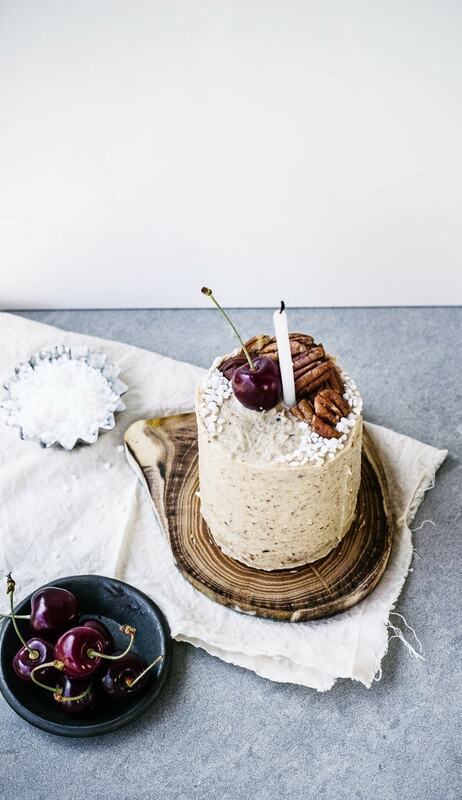 HAPPY BIRTHDAY, TOP WITH CINNAMON! 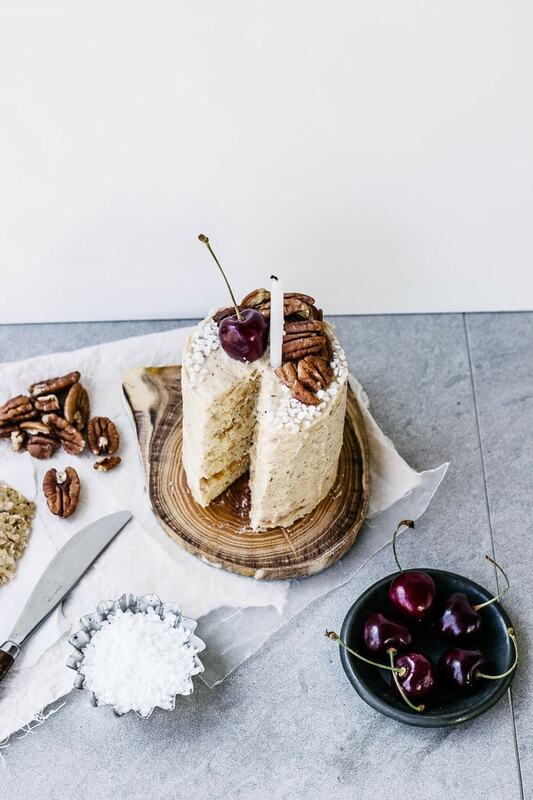 I love how your pancake cake looks like a real cake because of the frosting and not just a stack…. so beautiful! This is a lovely way to celebrate, happy 2 years anniversary! I’ve decided you’re a flippin’ (get it? wink wink) genius! I’m definitely making this! Happy Blogiversary! Congratulations on the great milestone! I just started blogging, and seeing what you have here makes me excited to imagine where I’ll be in two years time. Your cake is beautiful, creative, and fantastically approachable. In fact, I think I have all the ingredients to go try to whip this up now… 🙂 Thanks for sharing. Your photos are TO DIE FOR! I absolutely love the gifs as well! And don’t even get me STARTED on the food! I have a huge sweet tooth, so all of your sweets (even the healthy ones) make me drool. 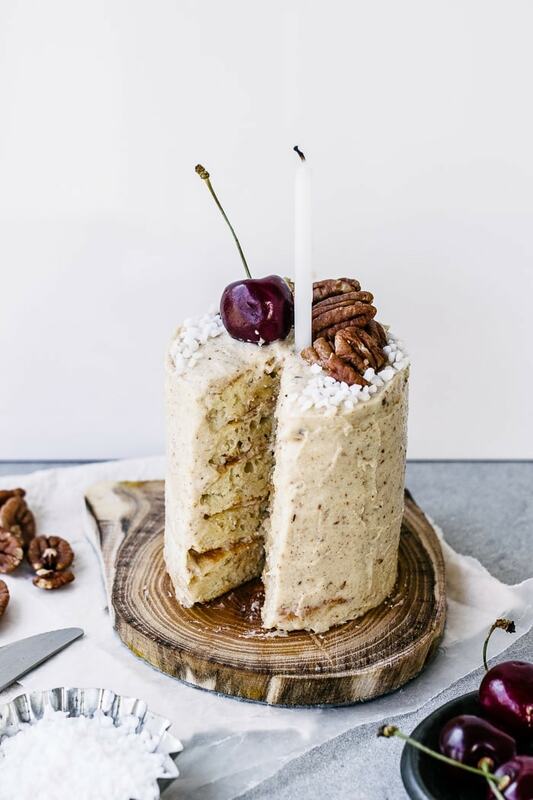 Never thought of doing a pancake-cake, and now it’s gotta happen. I also love how personal you are, you inspire me! I hope to start a blog of my own soon and you have definitely given me a lot of good ideas (which I would absolutely credit to you). Anyway, sorry to gush all over the place. Mad love. IZY this cake is so up my alley, it’s not even funnayyyy. LOVE THIS!!! Those pancake cake layers look SO incredibly thick and fluffy–love it! You are an absolute genius and congratulations on reaching two fabulously picturesque years of blogging! THIS IS SUCH AN AWESOME IDEA. Seriously… why did I never think of this. You’re brilliant. Pancakes are just begging to be made into real cake, right? Congrats, or rather, Happy Birthday! To you and your blog. I really need to try this sometime. It really is genius. Your blog is seriously one of my very favorites. Happy year #2. Keep up the splendid work! Congratulations on 2 years! You’ve already accomplished amazing things! 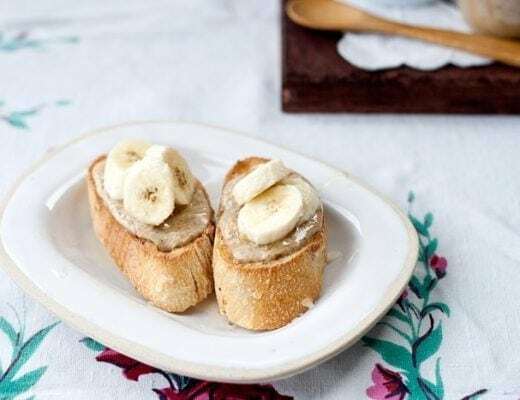 I love this creative recipe you’ve chosen to share. Gorgeous cake and congratulations on the 2 years! I’ll have to make one of these for my little pancake fiend (my son). He’d love it. What are the white granules on the top? Salt? Wow. They are huge. So much bigger than Indian Tree brand. Would you share your source? I grew up on buttermilk pancakes! I can’t wait to make this! I’m 62 and life just gets better every day! Thank you for sharing!! !